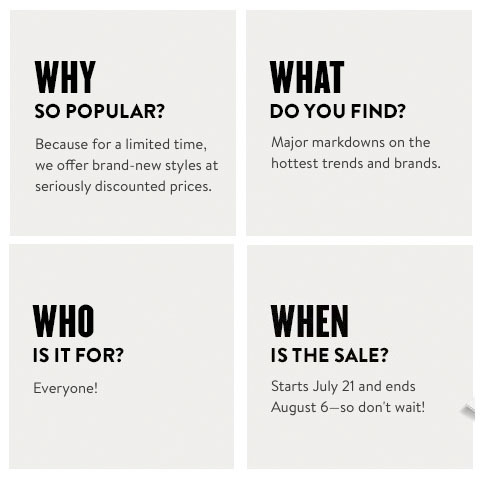 The best sale of the year is almost here, The Nordstrom Anniversary Sale - and you don't want to miss it! The Nordstrom Anniversary Sale is the sale you want to shop to score HUGE deals on pre-fall items! Yes, this sale features BRAND NEW fall merchandise at discounted prices, before the items are available to the public! I'm talking up to 50% off brand name items, such as designer denim styles, booties, handbags, sweaters and outerwear. You can get all of your fall wish list items purchased at Black Friday (or better) prices NOW, before they hit the shelves! Items are going to sell out super fast during the Anniversary Sale, so I wanted to give y'all some tips so that you can score everything thats on your fall wish list! If you're saying that you don't want another credit card, no problem! Nordstrom has a debit card option that connects directly to your personal checking account, similar to the Target debit card! Whether you get the debit or credit card, you still receive exclusive Early Access before everyone else on July 13th! To apply for a Nordstrom Card, go here. You need to go into the Nordstrom Anniversary Sale knowing what you want! Are you in need of some riding boots? Handbags? Jeans or makeup? Do you have a designer in mind? Make sure you know exactly what you are looking for and the amount of money you are willing to spend! I recommend narrowing down your search by designer and price! I'll be sharing my top 10 picks from early access next Friday so be sure to check back! Also you still have a few days to enter our $1,000 Nordstrom gift card giveaway! It the perfect way to start the Nordstrom Anniversary Sale! Enter at the bottom of THIS post! Thanks for sharing, I can't wait to stock up for fall! I am so looking forward to this sale! I can't believe it's less than a week away! Christmas in July! So many helpful tips. I love Nordstroms and I love a good sale! Thank you for the gift card opportunity I could definitely do some damage with that. Oh this is not going to be good for my wallet! LOL. Seriously though, I love these helpful tips. Ready to save! I'm so excited about this sale. It's Christmas in July! Seriously counting down the minutes! So GOOD. Can't wait to shop the sale! I can't friggin' wait...someone take my wallet from me! Ha! Now I love a good Loft sale, but this sale takes the cake every year!! I can't wait to see your top picks! This sale is one of my favorite times of the year! Great to know for shopping the sale starting today!